Going To Federal Prison? Need an Early Release? We Can Help! Using a scheme with the intention of defrauding another to obtain property or money. Employing false representation, pretenses, false promises and other similar fraudulent acts. Transmitting any writing, signals, signs, pictures or sounds by means of radio, wire or television communication. The Federal Bureau of Investigation (FBI) assumes jurisdiction over cyber crimes that include wire fraud and other crimes committed using technology or schemes covered under the 18 USC § 1343 statute. The US Secret Service may also provide assistance in wire fraud investigations. The US Department of Justice also get involved in criminal investigations and prosecution of criminal offenses involving wire fraud cases, when the same is committed against certain classes of persons or one that involves the general public. Imprisonment not to exceed 20 years and a fine of not more than $250,000. When the crime is committed by an organization, the fine is increased to not more than $500,000 with imprisonment term. The crime is qualified for a higher penalty in case the victim is a financial institution or one that was committed related to a natural disaster. In which case, the penalty of fine involved is not more than $1 million and an imprisonment of not more than 30 years. The cases below are examples and not actual clients, but similar to defendants we’ve helped get early release. Due to confidentiality, we do not publicly discuses client’s cases! MUSKOGEE, OKLAHOMA – On April 6, 2017, U.S. District Judge Ronald A. White, of the Eastern District of Oklahoma sentenced CRAIG DUANE GREENLEE, age 34, to 30 months imprisonment and 3 years of supervised release for WIRE FRAUD, in violation of Title 18, United States Code, Section 1343. GREENLEE’s, charges state he knowingly with intent to defraud, devised and executed a scheme to defraud a victim by falsely representing he could obtain a farm tractor and trailer. 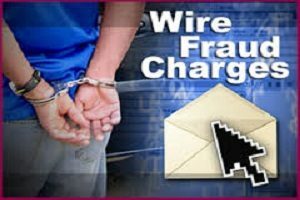 The Wire Fraud charges occurred by GREENLEE’s use of “wire communications in interstate commerce”. Greenlee’s wire fraud crimes were TEXT MESSAGES as well as EMAILS to defraud victims over $500,000.00. With a 30 months sentence, GREENLEE by law could receive 4 months and 5 days of good-time. GREENLEE should serve a total sentence is 25 months and 25 days in custody. Had GREENLEE retained Wall Street we could have gotten him qualified for a six month early release as well as an additional 6 months of Halfway House/Home Confinement. This would result in him serving as little as 13 months in a Federal Prison setting! LAS VEGAS, NEVADA – On February 23, 2017, Nevada U.S. District Judge Andrew Gordon sentenced GREGORY OLSON, 52 to 48 months in prison. OLOSN, a former church treasurer was charged with stealing as much as $1.5 million from the church in a wire fraud and tax fraud scheme. OLSON admitted in his Plea Agreement to defrauding the church in violation of Title 18, United States Code, Section 1343. His scheme was to withdraw unauthorized cash as well as check from church’s bank accounts. He also made false claims for reimbursement for church expenses, unauthorized receipt of mortgage loan proceeds, and solicited loans from individual church congregation members. Due to Olson’s fraud scheme the church end up in bankruptcy. OLSON’s Wire Fraud crimes occurred through fraudulent use of “interstate wire communications”, when he received $200,000 via an Interstate Bank Wire Transfer. With a 48 months sentence, OLSON by law could receive 6 months and 27 days of good-time. He would serve a total sentence is 41 months and 3 days in custody. Had Olson retained Wall Street, we could have gotten him qualified for a 12 month early release program, as well as an additional 6 months of Halfway House/Home Confinement, resulting in him serving as little as 23 months in a Federal Prison setting!